Welcome to Fordham Restoration Ltd. Thank you for visiting our business, the loft conversion and home extension experts for Cambridge. We have a skilled and experienced team. We only use the best building materials. We offer great customer service. Our work covers two areas: Home extensions and Loft conversions. We also carry out home renovations and stone masonry, when these are part of a larger home extension project. Just contact us for a no obligation comprehensive quotation. 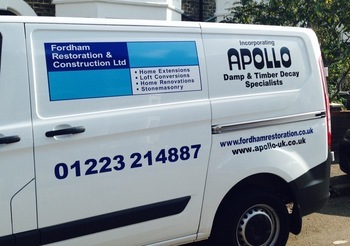 Through Apollo, the damp and timber decay specialists we also offer damp proofing, timber treatment and ventilation/condensation improvement services. See the link to the Apollo web site in the left hand menu.